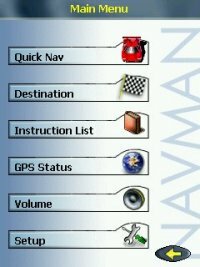 The Navman GPS 3420 package comes with the Navman sleeve, a suction cup mount, an auto power adaptor, and the SmartST Professional navigation software on 2 CDs. It only includes a couple page getting started guide in terms of hardcopy documentation. The auto adaptor doesn't include the connector, you need to hook it up to the iPAQ, strangely enough. Not a huge deal, but it seemed odd to me. The CD's are split up into western and eastern US. 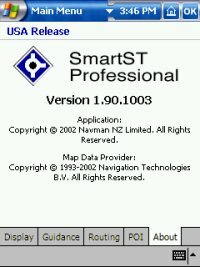 The CD contains the SmartST Professional software installer, map installation software, an iPAQ 3600 series ROM upgrade (I think), a quick start guide, the user manual, and a link to Navman for software updates. 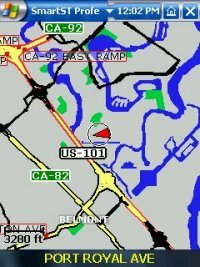 The map data is from Navtech, and seems pretty complete and recent. I first installed the software to my storage card, which was a bad idea, because it didn't work. It gave me an error about not being able to find the speech sound files. I re-installed to main memory, and it worked. I checked, but I couldn't find anything in any of the manuals that said it couldn't be installed to storage card. I then installed the map data, which is split up into large "zones," about 24 for the entire US, and they average approx 30 megabytes per zone. Some are smaller, some larger, depending on the area. I installed zone 11 (northern California and northern Nevada) and zone 12 (southern California and the southern tip of Nevada). It took a long time to install the maps, as for some reason it writes them very slowly. It tells you the rate of install after it finishes, and I averaged 40k/sec! Strange. This was to install to a 128meg SD card. 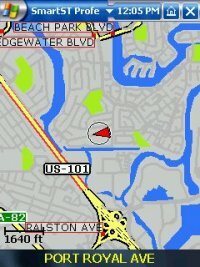 I started up the software, and it comes up to basically a blank screen telling you its looking for a GPS signal. The cold start took so long that at first the iPAQ turned itself off because it was on battery. Kind of annoying. I set the iPAQ to not turn off when on battery power, and restarted the software. After a few minutes it found a signal and showed me my position. 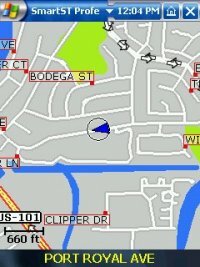 The software evidently has a lock to road feature, because it jumped from my actual position where my apartment is to the nearest road. To control the software you use a combination of the touch screen and the directional pad. Pressing left goes to the main menu, where it turns out you can bring up a GPS info screen instead of looking at the blank "waiting for gps" screen. Pressing up zooms the map in, pressing down zooms out, and pressing right toggles between the map screen and a text direction screen. 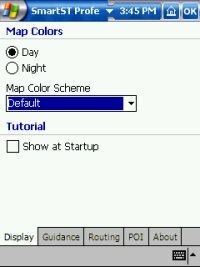 There are a few selectable map drawing schemes, and there is also a day and night mode, but you have to manually select it, it doesn't do it automatically based on the current time like a Streetpilot III does. 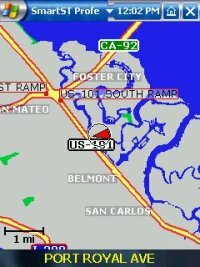 The map rendering seems very good, possibly the best of any Pocket PC software I have seen. 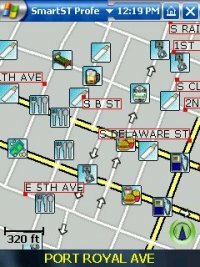 The maps are crisp and detailed, even including showing roads that are separated by dividers, arrows indicating one way streets, and attractive labels and symbols for roads and POI's. 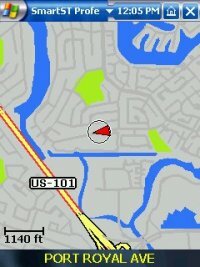 You can move the map around by "sliding" it similar to Mapopolis. It redraws very quickly after being moved, even if zoomed out quite a bit. 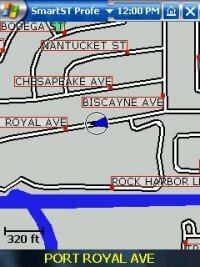 Identifying the name of a street is a little tricky because of the way it shows them, but once I got used to it it isn't too bad. 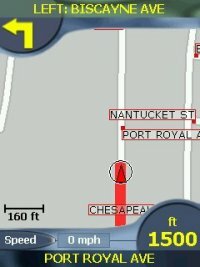 To show your position on the map it uses a little arrow with a circle around it indicating your heading and the current accuracy in exactly the same way the Garmin Streetpilot III does. 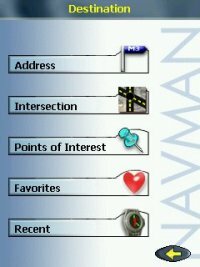 To find a destination, you can enter it in by address, intersection, point of interest, favourites, or recent destinations. When entering information in, you can enter in partial info and after a second or so it will show you a list of potential matches that you can select from. This didn't work until I clicked on the little US flag that was at the top of all the destination screens. I think to select my country. Presumably European versions would have flags for all the countries you have map data loaded for. Once selected, the country stayed selected so I haven't had to click it since. It also a little confusing in that when it says "area" it seems to really mean "city" in the destination selection screens. 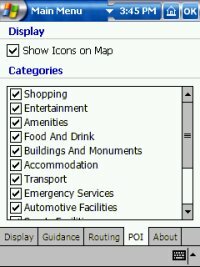 You can save several destinations in your favourites, I'm not sure of the maximum. 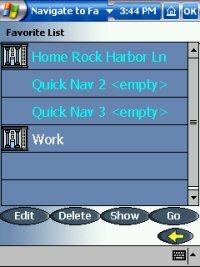 Three of your favourites can be designated as "quick nav" points, which are accessible from the quick nav tab in the main menu. Its a little tricky changing a favourite into a quick nav point, I had to look in the manual to figure it out. 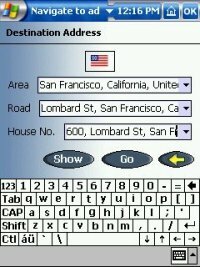 Its also a little strange setting favourite destinations, in that there is no way to directly enter in an address and save it as a favourite, but you can do it easily enough. Once you select a destination, it calculates the route. It shows the progress of the route calculation, which takes a few seconds for a short route, up to several seconds more for a longer route. It wasn't blazingly fast, but it wasn't tragically slow either. There doesn't seem to be any issues about loading zones, as I was able to route between zones and jump between map positions in different zones with ease. It seems to stitch zones together in the same way the Streetpilot III does into one big zone. The zones are very large in any case. There doesn't seem to be an underlying "base map," so you can't route to anywhere that you haven't loaded contiguous map data for, it seems. I'm guessing that cross country routes are possible, but you'd need to load a lot of map data. The available POI's are decent, but not to the level of the Streetpilot III. The POI's don't show up on the map unless you are fairly zoomed in, except for certain things like airports. Annoyingly, sometimes the icons seem to "stack up" on each other, so you don't know that a POI is present because it is "underneath" another POI. 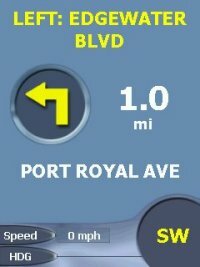 - a screen with text indicating the next turn, distance to next turn, the road you are on, the current time, your current speed, and your current ETA, as well as an arrow indicating the next manuever. You can also go to the main menu and bring up a list of text directions, an "instruction list." Some of the items on the various screens can be changed into other info, such as the total distance to go, the total time to go, and your current heading. Its actually quite nice. The layout of the screens is nice and the graphics are clean and crisp, the best I have seen I would say. 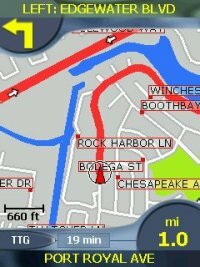 You can select a few routing options in the setup screen including quickest time, shortest distance, avoid toll roads, and avoid urban areas. You can also switch on/off the automatic rerouting. 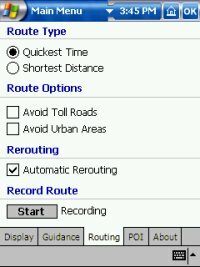 There is an option to record a route as well. 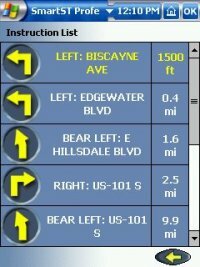 I did some test routes and they seemed good, no bizarre routes or illegal turns. The voice commands are a little fuzzy, but seem quite understandable and are well spoken. 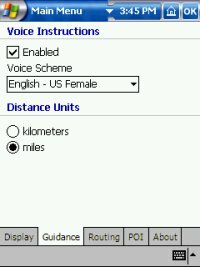 You can select between a male and female voice. You can select a volume level that will override your current volume settings, and this is saved so that every time you run the program the volume gets set to that level. It doesn't remember to un-set it when you leave the program, though. The voice commands are pre-recorded, not synthesized so it doesn't say street names. Touching the arrow symbol on any of the various screens makes it re-say the current directions, which is handy. Overall the interface is nice, but not completely intuitive. Most things seemed designed to be easy to use with a finger instead of a stylus, which is nice. Only data entry really requires a stylus, and even that could be done with a finger if you set the keyboard to large keys, as they recommend in the manual. The software overall seems pretty good, although it looks like a beta copy. 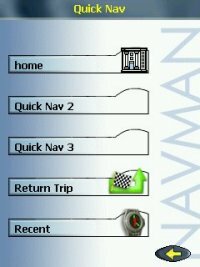 Its a bug fix revision or two away from being truly solid, but hopefully Navman will continue to update the software. 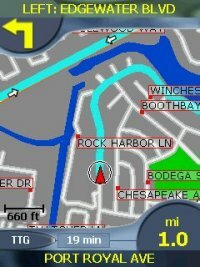 With some bug fixes and a few minor features, it could potentially be among the best Pocket PC GPS Navigation Software. Scott's created 6 more screenshots showing the favourites screen where you can edit and delete the favourites you add to SmartST Pro and also the complete array of options in the SmartST Pro Setup Screen.